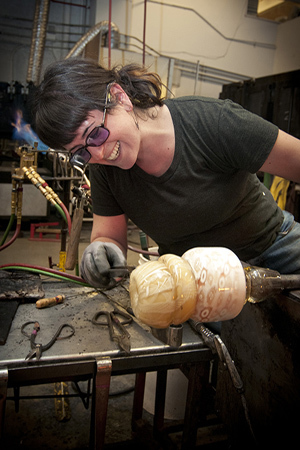 Rachel Rader: Currently, I’m in the process of creating my own fairy tale through a series of objects I’ve made — a collection of crown jewels from the sea: scepter, rings, orb, crown, and throne. The jewels belonged to a Sea Queen from the 1700s, who lived a life of decadence and overabundance. Neglecting her subjects’ pleas, she was overthrown and fed to the Giant Squid in 1793. For the same series, I’ve made a collection of cakes, tarts, and crumpets rich in detail and bedecked in dazzling Swarovski crystals. Collectively, these deserts are a sugary feast for the eyes, bloated and literally dripping onto the table. 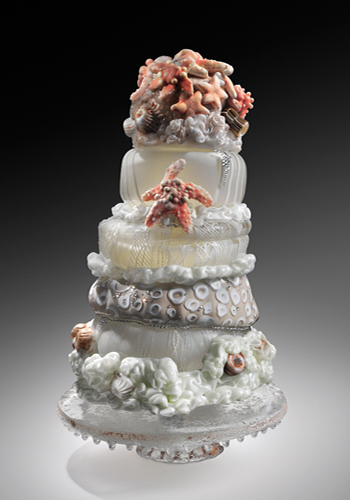 Rachel Rader, Five Layer Starfish Creme Surprise Cake, 2010. Blown, sculpted, and sand-cast glass, Austrian crystal. H 23, W 10 D 10 in. photo: daniel fox. I love how fairy tales can offer a veiled moral lesson through the storyline of magical creatures and a protagonist. In this series of work, I’m exploring environmental destruction and the clash between the rich and poor, all in a sugar-coated language. Rachel: I’ve recently stumbled upon the work of Lauren DiCioccio at the Bellevue Arts Museum. She recreates “trash” out of fabric and embroidery. She’ll make a plastic “thank you” bag out of chiffon and thread, which looks exactly like the bags we’re so accustomed to throwing away. Her work has me thinking about the value of objects in our consumer-driven culture. I’ve also been looking at the British graffiti artist Banksy’s artwork. He’s so witty in his use of imagery and location for maximum impact. The more people that see your message, the more power it gains. Banksy is out there in the streets trying to wake people up. His work makes me think about how I can make a bigger impact with what I do. 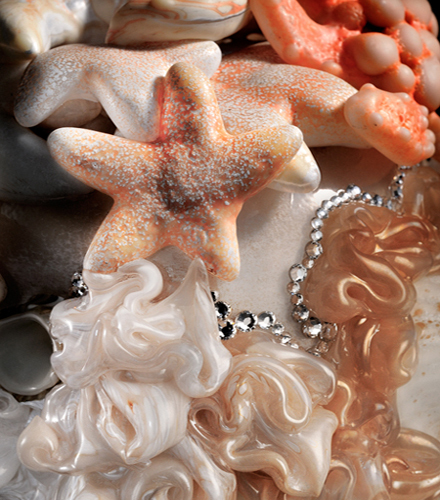 Rachel Rader, Five Layer Starfish Creme Surprise Cake (Detail), 2010. Blown, sculpted, and sand-cast glass, Austrian crystal. H 23, W 10 D 10 in. photo: daniel fox. GLASS: Where is it possible to see your work ? Rachel: I’m having my first solo exhibition at the Pratt Fine Arts Center’s exhibition space Gallery at Tashiro Kaplan, in Seattle. “HER MAJESTY” is an exhibition showcasing relics and commemorating the life of the Sea Queen. The show opens March 3rd and will be up until April 2nd, 2011.